In this quote Lao Tzu sums up how great things can be born out of humble beginnings. This is as true today as it has ever been, and we can see large organisations rise up with great success in the likes of Amazon, Netflix and Facebook. In some cases, from a humble start in someone’s bedroom an organisation has gone on a journey to realise unprecedented success. In the case of the above organisations a key challenge has been harnessing the power of technology in such a way as to unlock the potential of investment made in the business. Waterstons believes that this journey is one upon which any company can embark, by investing in IT Service Management in order to unlock hidden potential within their IT service. At its heart IT Service Management focusses on optimising people, processes and technology to ensure that the IT service is aligned to business goals and objectives, delivering tangible business benefits by increasing an organisation’s ability to manage and mitigate risk, respond to business change and enhance their customers’ experience. A common misunderstanding when organisations seek to use this framework is that the goal is to ‘implement ITIL’, whereas in fact it is to adopt, and adapt the elements which will deliver greatest value. By using this approach we can ensure that the IT service is both fit for purpose and fit for use within the organisation without adding the burden of unnecessary bureaucracy! Waterstons refer to this process of embarking upon a programme of IT service management improvements as the “Service Maturity Journey” and we have seen it used to great effect to unlock the value held within our clients’ IT investments. Tolkien’s Lord of the Rings trilogy recounts the story of a great journey of two hobbits, Frodo and Sam. The tale starts in the humble beginnings of the Shire where they set out on a noble quest to defeat the forces of evil by destroying the ‘one ring’ in the fires of Mount Doom. Along the way they encounter several noble companions who assist them in their quest as they journey towards Mordor. This tale has captivated millions and become a box office success; however it might surprise you to know that the journey they take is one which contains principles it’s useful to capture in our business context. Frodo at the start of his journey knows where he is – his ‘Bag-end’ residence in the Shire. As the story unfolds his final destination becomes increasingly clear allowing him never to stray from his goal. This clarity of vision allows the fellowship to embark upon the quest before them and determine how they will reach their goal. Similarly, as we embark upon a programme of IT service maturity, we need to be able to answer similar questions in our organisation. Where are we now? Where do we want to be? And, crucially, how will we get there? 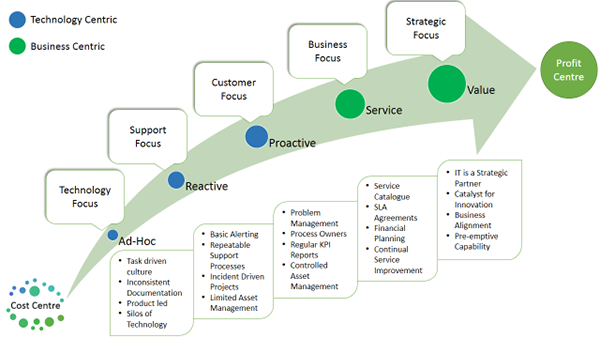 In order to help answer these questions Waterstons has created the Service Maturity Model to help map this journey with our clients. On the below diagram you will see a starting point which in our experience is where IT has traditionally been seen as a drain on resources or ‘cost centre’. To the right of the diagram you will also see a destination which is one where the IT services deliver real value back to the business i.e. a ‘profit centre’. Along the way five maturity levels are described which set out the steps of the journey and the building blocks which mark our milestones along the way. The maturity model can help organisations to review their existing IT service and allow them to benchmark where they are on the journey. In addition to assessing the current level of maturity, it can also provide a glimpse of what those processes, toolsets, culture, or even the service as a whole might look like as we improve them. This serves to establish our destination. Armed with a clear idea of ‘where we are now’ and ‘where do we want to be’ we can start mapping out the steps which will take us on the journey of IT service improvement. The journey starts with a clear sense of vision obtained from the Waterstons Service Maturity Model and proceeds with activities designed to clearly map out the status quo from the perspectives of people, process and technology. 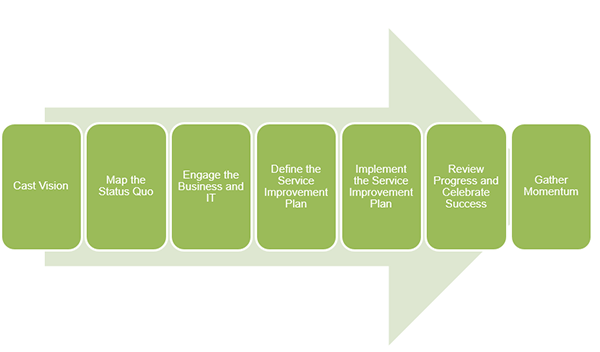 Before outlining the next steps, key stakeholders are engaged both from within the IT service and the wider business. This provides the opportunity to understand existing pain points, opportunities for improvement and clearly define what ‘value’ looks like in the context of the organisation. Equipped with a detailed understanding of our client’s current location and final destination a service improvement plan can be outlined. This will include quick wins, designed to realise value with minimal cost, and to pave the way for medium and long term objectives intended to better align the IT service to the needs of the business. Along the way care is taken to review improvements and celebrate success across the business. It is often found that this leads to a change in perspective such that IT is seen as a constantly present and positive force for change across the business rather than being invisible until an incident or outage occurs. As momentum increases and lasting improvements are realised an organisation can start to reach the ‘service’ and ‘value’ levels of maturity. These are achieved not solely through an investment in technology but a fundamental change in the way IT serves the organisation. The IT service becomes ‘business-centric’ as it measures itself in terms of the value it is able to contribute to the business, rather than against the technology-centric KPIs (e.g. 99.99% availability) which were previously used. The result is that a more proactive and service-focussed IT service is achieved that enhances the productivity of the organisation while yielding a greater return on IT investment; downtime is minimised, IT services are unified and the value obtained from assets is optimised. Waterstons’ commitment to excellence in IT service management has delivered real business benefits to our clients in a number of ways. By considering a recent service improvement project, we can illustrate how service maturity goes beyond theory to deliver real value. A large UK port engaged Waterstons to define a service improvement plan with the aim of realising value from investment in IT service management. Waterstons’ approach was used to clearly understand the current challenges, opportunities and organisation goals. A service improvement plan which included improvements within the context of people, process and technology across the port was developed. Within the ‘People’ area it was identified that the adoption of business and technical service owners, detailed as part of a Service Catalogue, would help the port to mature a number of existing IT services; and to create a culture of ownership within the IT team. A customer survey was also commissioned to benchmark future improvements and obtain information pertaining to the criticality of each business system. This information was used to define SLAs for all major IT services, ensuring accurate prioritisation of incidents and service requests across the organisation. A review of existing IT support processes highlighted that the addition of several communication points into the support process would serve to significantly improve the customer experience. A new problem management process was also defined to review recurring significant incidents, to reduce the cost associated with interruption of critical IT services. An initial training session was held to equip the team with problem management skills and the process ownership was assigned to the service desk manager. In terms of technology a number of quick wins and productivity improvements were highlighted which revealed opportunities to improve a number of existing services including the Citrix user environment and wireless network across the site. The creation of a central knowledge base was also highlighted as a short term improvement which would remove knowledge silos and help improve the first fix rate of the service desk when supporting end users. The IT manager commented that the service improvement project led by Waterstons provided a valuable insight into the perception of the IT service across the business and identified several opportunities for improvement. The port has benefited from the service improvement plan provided as part of the exercise which identified quick wins and key milestones to improve the IT service offered to both staff and customers. In today’s business world the ability to unlock value within IT investment is essential to ensuring success. Waterstons believes that the key to doing this lies within the IT service management journey, which can be undertaken by organisations of any size to ensure that their IT service supports business goals. The journey starts by establishing an understanding of the status quo, followed by the formation of a vision for service improvement supported by Waterstons’ Service Maturity Model. Steps can be taken towards the destination by outlining a service improvement plan with short, medium and longer term goals to evolve the IT service into one which delivers real value to the business. The journey may seem daunting; however, in the words of Lao Tzu, it starts with a single step; one which can be the starting point to unlocking the true value of your investment, and transforming your IT service into a strategic partner! An agile approach for rapid PC deployment looks at how Teesside University optimised people, process and technology using IT Service Management to rapidly deploy new applications and hardware. Is VDI right for my business? Charlie Hales looks at the reasons why VDI might be right for any business now that some of the legacy constraints have disappeared. Citrix- what's new in 2015?